"Great art challenges not only the viewer but also the artists who create it. Most artists paint what they know and do it to the best of their ability. A few artists take on creative work that challenges their knowledge and reveals their inabilities. However, when they do overcome this kind of challenge, they realize that the rewards are huge. Artists who need ongoing reassurance that they are on the right track may miss the opportunity to reach past their comfort zone to experience the thrill of pleasing themselves with a painting that shares the truth of their view of the world." The gallery helps to advance CMCM’s mission of promoting cultural arts, community media, and civic engagement by showcasing the work of established and emerging artists. Public programs such as artist talks, film screenings, art performances, and social events enhance our overall mission by supporting further opportunities for conversations to take place. Selection Process: Once an artist has submitted all materials, the application and materials will be reviewed and respond to the artist within 3 weeks of submission. Exhibitions are scheduled many months in advance. Once selected, a meeting will take place to set the exhibition dates and define the schedule of tasks to precede the opening reception. Commission: CMCM does not take any commission. Liability: All work will be handled by the artist. The Georgia Annwell Gallery will not be responsible for work lost or damaged in transit to and from the gallery. Artists are responsible for shipping cost to and from the gallery. A liability release document will be signed by the arts and gallery administrator. 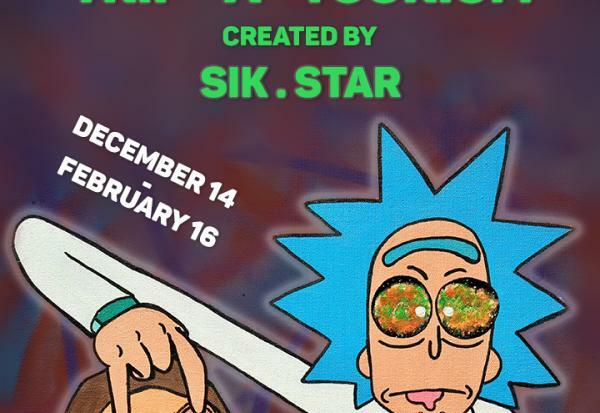 The thought-provoking work of Sik.Star will be featured in CMCM's Georgia Annwell Gallery Space from December 14 to February 16th! Featuring paintings and mixed media artworks, Trip-a-tourium is an all blacklight exhibition. Come dressed to glow! Sik.Star pulls from humor, conspiracies, pop culture, spirituality and life experiences to create psychedelic pieces that challenge the viewer's perception and invites them to form their own opinions. She is a proponent of using recycled resources to utilize items we take for granted such as up-cycled spray cans, lamps, mannequins, and other oddities.